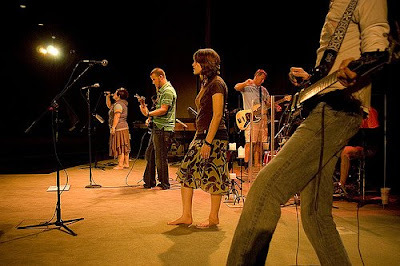 Every so often the worship team likes to go barefoot onstage. They're just keepin' it real. You know, I'm not sure about this one ... my last two churches had rules about this: no open-toed shoes and no bare feet. One church has an easy explanation - the stage is at eye level with people sitting down, and come on, who wants to stare at a guy's hobbit feet? we also have a similar rule that really strict on it though. I'm a worship team drummer, and find I have better control over the instrument if I don't wear shoes.. It does get a few comments from people that think I'm being weird, but people soon understand it's just a part of my worship. Not ritual, but functional. And there is a place for 'functional' in worship right? But just being barefoot for the sake of it.. hmm maybe has it's place too, I really don't know. Maybe I'm just used to the idea, far too biased to have an opinion. I never really paid attention to anything that went down worship-team-wise when I had my experiences in the evangelical circle. I was too busy hiding in the back thinking that everything was really weird, while at the same time, trying to wrap my head around the fact that many of these people swaying back and forth with their arms in the air were raised to believe that I prayed to statues. Or maybe it's just comfortable. Yeah, this barefoot-for-barefoot's sake always puzzled me. It felt contrived, like some "hey, we're cool and casual" trick, but I found it distracting. I mean, I'm cool and casual, but I'm wearing my shoes at church. I'm so glad I'm a Methodist. As our music team is situated in the transept of a drafty Victorian church going without shoes isn't often an option. this is hilarious! my good friend led worship this past sunday and did it barefoot. we both frequent this site, he's going to get a kick out of this! Sometimes I work a shift in my Christian bookstore barefoot; and I knew a pastor who often worked barefoot in the church office. If anyone asks, I just say it's holy ground. I just found this blog, and I love it. But I'd like you to confess, right here and now, that Steve Furtick doesn't really exist, and is just a figment of your imagination. Being a Kiwi - I reckon they should wear Ugg Boots ... Pamela Stevenson does - so it must be right!!! -eh? Me longtime listener, first time baller...I hear your website on funny podcast, Grapes of Rapes. No, he means Pamela Stephenson (http://en.wikipedia.org/wiki/Pamela_Stephenson) aka Mrs Billy Connolly, who does indeed come from New Zealand. About Steve Furtick, I do not accept the existence of that website as very good evidence. What I see there is a perfect instance of everything you so perceptively point out on this blog, so I believe the whole thing is a very accomplished parody. I'd much rather believe that than what I really suspect to be the truth. Oh haha! Shows how much I know. I hope I am also wrong about the existence of Steven Furtick. Acutally it was a typo I meant Barbara Bush wears Ugg boots. ..... Mike you are one bright guy!!! and I agree with you this is a great site. The problem with barefeet as I see it is ... even a cool person walks like an idiot when he stands on a tack. Ha! Funny cause it's true. Please do a post on Christian camps...all the ones I went to were so awful...but then if you write about it I can laugh about it. In the Coptic Church they take their shoes off to receive communion. I find it amusing that so many worship "teams" are arrayed in front of the congregation like musicians at a concert. They aren't shaping culture--culture has shaped them. Reading this makes me so glad I'm a Jew and one of the Chosen People. Ain't no one no how showing up at temple without shoes. You goyim be crazy! Scot, I don't find it amusing - I think it is worrying that "worship teams" like to be centre stage instead of leaving God there. Having said that you do need to be at the front to lead the singing but off to one side is preferable. I have just realised one of our singers often goes bare foot but not only is she standing on the carpet but at 6ft she is taller than the rest of us. Do you guys hold hands during prayers? And if you're barefoot, do you touch toes during prayers? Hand-holding during prayers is very common. But absolutely no toe touching. That's just kinda dodgy. Yeah, but every now and then some "innovative" Christian Culture person decides their church needs to have a footwashing ceremony too, normally around Easter. Maybe footwashing + pedicure before being allowed on the worship team? I am a priest in the Celtic Catholic Church. Our custom, shared to some extent with, e.g., the Coptic Orthodox, is for all the ministers, and even the entire congregation, to be barefoot in the church or anywhere while worshiping. "Take off your shoes...." For us, this is no self-conscious fad, but an ages-old way of reverence. I always feel odd when I visit a church and feel the need to wear my shoes so as not to cause a scandal. It is not always pretty, but worship is about beauty, not pretty. 2. Makes it easier to wash each other's feet. 3. If we're truly bearing the Gospel, our feet should be beautiful anyway. Why not show them off? 4. Being closer to the ground makes it easier to prostrate yourself. 5. David danced shoeless (and naked) before the Ark. Surely, we can at least bare our toesies? 7. Which sounds better, "And did those FEET in ancient time" or "And did those REEBOKS in ancient time"? 8. People kill each other for shoes. By wearing them to church, we prop up the shoe subculture. 9. Celtic Christians walked barefoot to the top of Croagh Patrick. Surely we can do it to our pew. Plus, they're called "pews". Let's add some pungent reality to the name! 10. God doesn't wear shoes. Feet are not beautiful. If you think so, then perhaps you have a fetish and we know that ain't beautiful. Feet are beautiful. If you think not, then perhaps you have a neurosis, and we know that ain't beautiful. Keep your shoes off, like Moses at the burning bush. To me, leading worship (can be) a very convicting experience, in which God reminds us of how awful, and sin-filled, our lives are---and yet still chooses to use us to facilitate the worshipping of others. When this occurs, I personally feel akin to Moses before the burning bush---that I am not worthy to be in God's presence! Thus I remove my shoes as an act of humility and reverence. That being said, however, I typically only go barefoot on the stage at Montreat, which I view (with, admittedly, some good old Presby pride) as a "holy of holy" place. Then again, I really don't think God cares what we choose to wear. Evangelicals don't do it as an act of humility and reverence though (even though God doesn't care what we choose to wear), it's more like they want to be earthy by being barefoot onstage like Joss Stone or Henry Rollins or something. This whole blog site is brilliant, really. I'm laughing because it's all mostly true for me. I've never been able to put my finger on why I've hated so many churches, but now I see, that the one I do like and currently attend, does the least of these things. Nice job at presenting the facts. Too bad some people get defensive instead of reflecting on why they have these habits. The barefoot thing in particular...my husband plays guitar with a pedal board and all, so if it's summer he'll take off the flip flops so he can manuever the pedals and switches, but I totally would feel creeped out going to a church that goes barefoot for the whole Jesus factor...it all seems so fake and planned. On that note, I hate when the worship lead keeps strumming along some pretty chords while speaking their words of wisdom. I feel like sometimes, worship, or their tunes, placed at the right spot during a service can lead people to be manipulated. 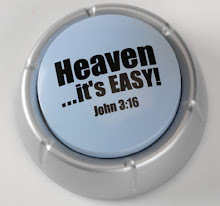 All that feels like it detracts from a true relationship with God and each other. Keep doing what you're doing, you seem to have a good sense of what Christianity should be about. haha that's just lame observation man. but smart one though. i worship in church every sunday and these things don't matter really. Well I wear flip flops almost all year long, but anytime I do wear other shoes they usually end up coming off because they're uncomfortable. My church family knows I run around in my bare feet all the time. It's just who I am. Plus while I was an assistant missionary in Japan I got used to it. Japanese christians never wear shoes inside, especially not in a church. I think American's are too preoccupied with self-image, but maybe that's just me. I do find all the other comments quite interesting though. well I love this! So its Sunday night and I get home and check my facebook. Someone at our church posted that they found it inapporpriate for an adult (ME) lol to be running around the church barefoot on or off stage. 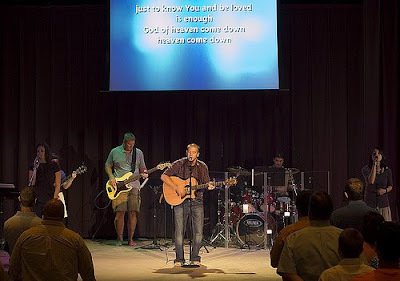 I lead worship and i cant stand no being barefoot in the summer. What is the difference if I keep my flip flops on or off? It cracks me up. When I was a very young christian (Might not even have been baptised yet I saw Rich Mullens (Our God is an Awesume God, guy) lead worship. He was in a beat up pair of levis and a plain white T shirt and barefoot at the piano. I was so moved by his words and his music. I will never forget it. He was so comfortable in God's presence. I was a total suit and tie church person. I was in a BB King Tshirt and camo shorts and barefoot today. I dont know if I care or not about this. Its not the first time. I dont have gross feet. I keep them clean and nails trimmed. They dont stink. I think I will leave it up to the preacher to decide. We are a very laid back church of around 600. Preacher was in jeans, polo and tennis shoes today. Love everybodies input on this. all my kids hate wearing shoes, hmmm maybe they are onto something ? You know any worship leader you asked about it would tell you "it's because I'm standing on Holy groundblah blah blah..."
trendy trend trend. They're just trying to make themselves feel all "humble" and earthy and "relevant." Ugg relevant. Hippies. The only thing grosser than Christians is CHristian Hippies. I'm just wondering do any of you have any biblical evidence on why we should or should not be able to be barefoot while worship leading? love the last comment.. any biblical evidence on why we should or shouldn't be able to be barefoot..depending on your age and background you will look at it differently....could be considered Pharisaical (sp?) both ways.... if we only cared this much about people who need Jesus and had big discussions best ways to reach people for Jesus at work, etc. etc. or people who are going through rough times.. I remember Rich Mullins often did his concerts barefoot. I think it is fine to go barefoot in church.